Got a question or comment about Attractions in Ecuador? Ask a Travel Expert! Ecuador is most famous as a travel destination for it's ecological wealth and the most notable tourist attraction is the Galapagos island chain, once the scientific playground of Charles Darwin. On this small archipelago of volcanic islands weird and wonderful animals like the giant tortoise and marine iguana can be observed. Tourism on the Galapagos is strictly controlled to preserve the famous eco-system. 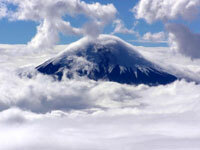 Other breathtaking natural wonders in Ecuador include the many volcanoes, particularly Cotopaxi, which is one of the highest active volcanoes in the world and home to one of the few equatorial glaciers in the world; the Amazon rainforest, which attracts many adventurous travellers, with the town of Tena the most common launching point for jungle treks; and the Cuyabeno Wildlife Reserve, in the Andean foothills, which is a great favourite with nature lovers. Those wanting to experience the scenic Ecuadorian coastline would do best to head to the southern coast, where numerous picturesque beach resorts can be found. The most popular of these is the pretty town of Montanita. The capital, Quito, is the transport hub of the country and attracts tourists in its own right with colonial architecture, colourful markets, and Cotopaxi looming in the background. Cuenca is also a very attractive town and a hotspot on Ecuador's tourist circuit.